Requested from PCOO by Patrick Lozano at 08:27 AM on Jan 24, 2019. I would like to request for a copy of the PSC and FOI-PMO Memorandum Order No. 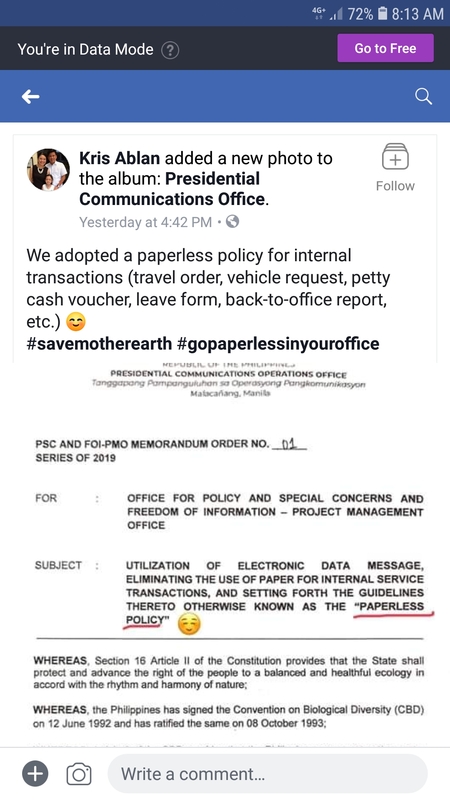 1 Series of 2019 entitled "Utilization of Electronic Data Message, Eliminating the Use of Paper for Internal Service Transactions and Setting Forth the Guidelines Thereto Otherwise Known as the Paperless Policy. I found out about this policy through Asec. Kris Ablan's post on Facebook last January 23. I believe this will help our office, the Philippine Economic Zone Authority, in a similar aim of a paperless transaction as well as the digitization of our records. Thank you &  hoping for a swift response. Thank you for your request dated Jan 24, 2019 08:27:34 AM under Executive Order No. 2 (s. 2016) on Freedom of Information in the Executive Branch, for PSC and FOI-PMO Memorandum Order No. 1, Series of 2019. We received your request on Jan 24, 2019 08:27:34 AM and will respond on or before Feb 14, 2019 08:27:34 AM, in accordance with the Executive Order's implementing rules and regulations. Should you have any questions regarding your request, kindly contact me using the reply function on the eFOI portal at https://www.foi.gov.ph/requests/aglzfmVmb2ktcGhyHgsSB0NvbnRlbnQiEVBDT08tMjQ3MzUwNzM0NzIwDA, for request with ticket number #PCOO-247350734720. Thank you for your request made this morning under Executive Order No. 2 (s. 2016) on Freedom of Information in the Executive Branch. You asked for PSC and FOI-PMO Memorandum Order No. 1, Series of 2019. Your FOI request is SUCCESSFUL. I enclose a copy of PSC/FOI-PMO Memorandum Order No. 1 S. 2019 regarding our office's Paperless Policy. It is our office's first attempt to implement such a policy. Do let us know if you find any items for improvement, so we can adopt the same. We hope you find things in order. Thank you.